Much like my cookies, I like my Mac and Cheese to be rich, thick, and creamy. This recipe is more like a thin and crispy cookie, but I can still appreciate it for what it is – a quick and easy baked macaroni and cheese dish with good flavors that a lot of people will prefer. The caramelized shallots are really delicious and the addition of hot sauce gives this pasta a unique flare. Truth be told, the goat cheese topping was my favorite part. It’s hard to pass up anything covered in goat cheese though, right? Plus, like most casseroles, it tasted even better on day two. What I’d like to do next time is utilize the addition of shallots, hot sauce, and the goat cheese topping in my traditional bechamel based macaroni and cheese recipe. That way I’d have all of the sassy flavors in a more substantial and hearty sauce. 2 1/2 teaspoons hot sauce (such as Cholula) Note: I used Frank’s Red Hot since that’s all I had. Preheat oven to 400°F. Butter 11x7x2-inch glass baking dish. Melt 3 tablespoons butter in heavy large skillet over medium-high heat. Add shallots; sprinkle with salt and pepper. Cover and cook 5 minutes, stirring often. Reduce heat to medium. Cook, covered, until shallots are deep brown, stirring often, about 6 minutes. Meanwhile, cook macaroni in large saucepan of boiling salted water until just tender but still firm to bite, stirring occasionally; drain well. Reserve pan. Bring half and half and hot sauce to simmer in same saucepan over medium heat. Toss cheddar cheese and flour in medium bowl to coat; add to half and half mixture. Whisk until sauce is smooth and just returns to simmer, about 2 minutes. Spread pasta mixture in prepared dish. Top with shallots, then goat cheese. Sprinkle with pepper. Bake until heated through, about 15 minutes. Awesome easy recipe Erin! I’m not sure why I never thought to add hot sauce IN my mac and cheese! I also just slather it with hot sauce after it bakes… adding it before just sounds delicious. I love grown-up mac and cheese so much better than the classic kiddy stuff. It always surprises me! That looks delish! Now I want some good home-made mac n cheese. Kraft=blech! (Annies is ok in a pinch though)! Oh! I saw this recipe in Bon Appetite and was thinking about making it myself, but was unsure it would live up to my picky mac & cheese standards. 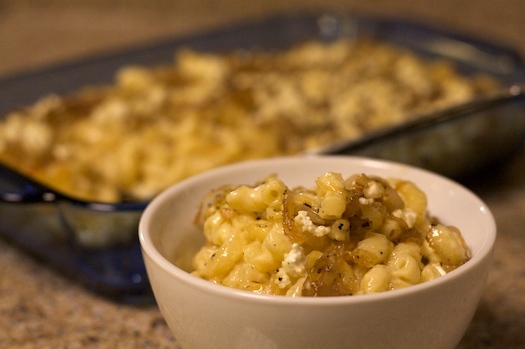 The goat cheese and shallots do sound awesome, but I prefer thick and creamy mac & cheese too. I love the addition of shallots!! I just watched a mac and cheese competition on Food Network last night! Now you show me this lovely creation. I must have some mac and cheese NOW! Holy cow! My boyfriend would love me if I made this for him! Thanks for the recipe! Wow. I saw this recipe, but I just glanced at it. That is a LOT of shallot. Man. I’m with you and the bechemel base. Ok …. so the bechamel sauce based recipe? I browsed this recipe in my mag just yesterday and thought it looked intriguing. Glad to see it here! Yummy. Hi there. I was just clicking away from different blogs and came across yours. Wanted to say hello. This mac n cheese looks outstanding!!!!!! I love the addition of the shallots! Sooo need to try this!!! Hot sauce in mac and cheese sounds interesting. I am curious as to how it tastes. Great recipe! Thanks for sharing, Erin. and macorni and cheese with hot sauce is my favorite, hot sauce makes everything taste better.